A dog has been set on fire by two teenagers in Maghaberry, County Antrim. The attack happened on Sunday morning and the three-year-old collie has suffered serious injuries. 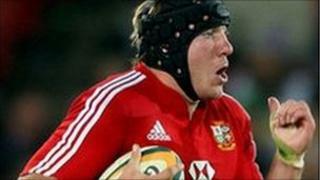 British and Irish Lions rugby international Stephen Ferris is a friend of the dog's owners. He described the attack as "inhumane" and said the dog is "fighting for its life". "I was up at the north coast on Saturday and came home to a pretty horrific story of a good friend of mine who lives at the bottom of the village of Maghaberry," he said. "Unfortunately his dog, a wee collie called Cody, was set on fire using lighter fluid on Sunday morning. "I think it is just vandalism of the nastiest sort. "The dog is as friendly as they come. "Hopefully the poor thing can pull through." Mr Ferris said the owner of the dog had two small children and that the incident was "pretty disturbing" for the whole family. "Getting your dog set on fire is a terrible thing to wake up to on a Sunday morning," he added. Mr Ferris said he hoped those responsible for the attack would be caught.